On 1 March 2010, Aryan Kaganof’s new film, The Exhibition of Vandalism, was shown during a colloquium of the Department of Music. The event was attended by the film maker, who afterwards talked about the film and answered questions. The Exhibition of Vandalism documents a musical ritual performed by the acclaimed musicians Zim Ngqawana and Kyle Shepherd. The film shows how Ngqawana and Shepherd make music in the vandalized space of Ngqawana’s Zimology Institute outside Johannesburg. The musicians use, amongst other things, the broken pianos and building debris, while Kaganof’s camera interprets the events in a virtuoso, musically sensitive epic of grief and loss. Fundamentally the film speaks to the broken and torn fabric of South African society, and the place of music in such a society. It is a defiant answer to Adorno’s question about the role of art in a history that has become utterly dystopian. The impressions created by the film were so overwhelming, that a group of students (Die Raad) from Stellenbosch University’s Department of Music decided to invite Ngqawana, Shepherd and Kaganof to present a continued interpretation of the Exhibition of Vandalism in Stellenbosch. The performance will take place on 1 May at 18:00 at Star Metals, 27 Tennant Street (From Stellenbosch: take R44 towards Paarl; turn left at first set of traffic lights into Tennantville; turn left again into Tennant Street). The motivation for these students to initiate a Stellenbosch performance was to show solidarity with Ngqawana and to help him generate funds to rebuild the Zimology Institute. Ultimately these young South African musicians and musicologists wanted to demonstrate unanimity with the powerful critique and declaration of hope articulated in the music and film of Ngqawana, Shepherd and Kaganof. In recognition of the importance of the Zimology Institute as a space protective of non-commercial music making and the mentorship role Ngqawana played and continues to play for young and cutting-edge South African musicians, the Documentation Centre for Music (DOMUS) decided to sponsor this concert in Stellenbosch. DOMUS’s mission statement makes provision for the strategic support of performances and recording projects to preserve music as an important part of a broad South African heritage. The Exhibition of Vandalism is supported as an exemplary event of what performance as musical curatorship could be. 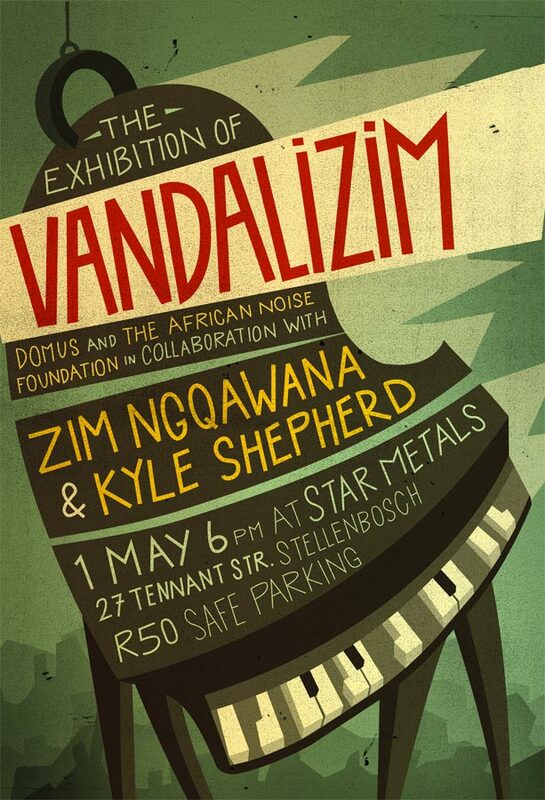 After the the viewing of Aryan Kaganof's film, An Exhibition of Vandalizim at a departmental colloquium, a number of students at Stellenbosch University arranged a concert with Zim Ngqawana and Kyle Shepherd on 1 May 2010 at Star Metals, Tennantville. Footage of this event can be seen on the South African Music Research Blog.